An interesting take on zombies (although here they’re called infected,) that considers some of the real questions and issues in this sort of a scenario. 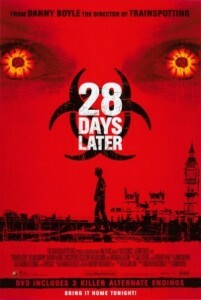 28 Days Later is like outbreak meets i am legend. the people on the streets have clearly turned into zombies, but the movie wants to insist that they are just infected, and nothing more. there’s a virus out, and there is no antidote. it turns people into monsters who spit and vomit blood, have bloody eyes, and walk with major twitches. these creatures also eat people, which is really where the zombie thing comes in the most. only it has one thing over zombies, which is that these creatures move fast. in every zombie movie, the thing that holds those monsters back is how slow they move. by making it a virus in this film, they are able to get away with having the creatures move around quickly, and more ferociously. just like the t.v. series “the walking dead,” the movie opens with a character in the hospital, who was in a coma when all of the hell broke loose, and slept through the entire thing. now, he wakes up, walks out of the hospital, and finds himself on the abandoned streets of england. all of a sudden, we’re in i am legend territory, as we see recognizable sights (big ben, parliament, the thames river and the ferris wheel structure that looks over it.) only just like that will smith movie, the character walks these streets alone with not a single other person in sight. in that movie, the film opened up to this abandoned atmosphere, and then to will smith driving through it. we were the fish out of water there. here, in 28 Days Later, the character is the one who is experiencing all of this right alongside us. just like all of these movies, it isn’t long before he finds other people. no movie wants to be cast away with zombies and have one actor all alone for the whole film, although i am legend certainly came close. here, in 28 Days Later, the star, jim (cillian murphy), has a few run-ins with the infected creatures, and is about to be killed when suddenly two humans come and save him and kill off the attackers. these two explain everything to jim, but he doesn’t really see just how bad things have gotten until one of his new mates turns he and the other one, selena (namoi harris), have to deal with it. after that, they go and find a father (brendan gleeson) with his young daughter and get them to join in the drive to safety. that drive is to a military base that his been broadcasting over the radio frequency (just like in i am legend.) the movie is decent in it’s first half, but it’s also pretty straight forward. it’s all attacks by the infected and trying to explain how things got to the way they are. once the characters reach the military base, however, things get a lot more exciting. the soldiers on the base have a different agenda than our heroes do. it all starts out with everyone being cordial to each other and the head commander taking jim on a tour of the base. but then when he starts explaining how it works with his men and what they have in mind, things take a turn for the worse. the military base second half of the movie is about looking to the future, whereas everything that came before it was about explaining the past. the military base scenes also give us a new and unexpected enemy. the infected were exciting, but after a while it seemed like we needed something more, and with the military base, we got exactly what we needed. the movie is good, but it isn’t great. that’s because it’s first half might be scenic and interesting, but it’s also a little slow. there are either attacks or there aren’t. other than that there’s just a lot of explaining. but there are no surprises in that first half. once the characters get to that base however, everything changes. suddenly the plot becomes a lot more creative, and the story more exciting. 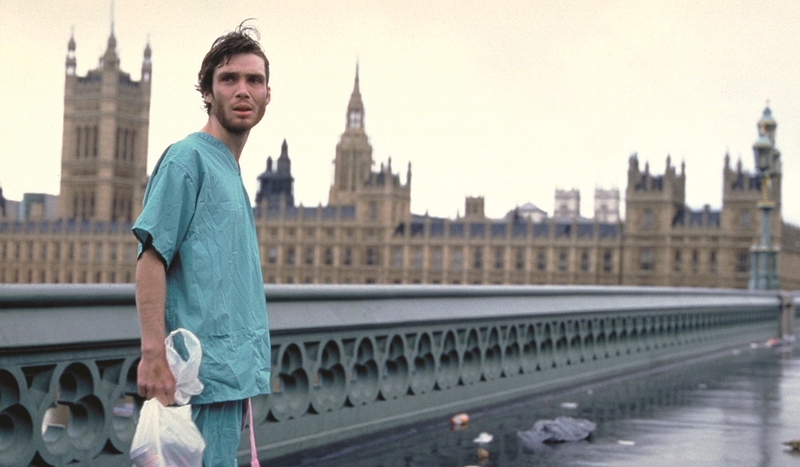 28 Days Later was directed by danny boyle, and it’s one of his better movies. trainspotting will always be his best, but this movie is right up there with his most acclaimed movie, slumdog millionaire, as another great success.